Picture of Hudswell Clarke 0-6-0ST Renishaw Ironworks No 6 with a coal train during a photographic charter on the Tanfield Railway organised by Gateshead Camera Club. The charter featured steam locomotive 0-6-0ST Renishaw Ironworks No 6 and the NCB coal train, recreating the sights and sounds of the coal trains of the 1960's. 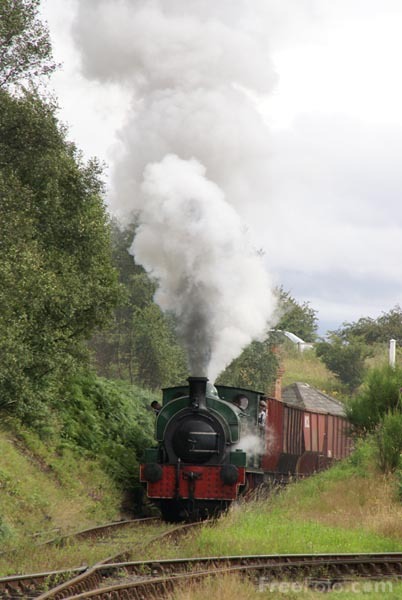 The Tanfield Railway is famous for it's popular Coal train days, which are normally held every February and October. So the camera club enjoyed re-creating a coal train day on a sunny Saturday in August.